Wouldn't it be nice to drive a car that gets 35 mpg? Wouldn't it also be nice to have a stylish, sporty and comfortable ride while also being economical? The 2013 Mazda3 4-Door Grand Touring is all of the above: fun, sleek, and VERY intelligent. *My husband and I were given this vehicle for one week for review. No other compensation was received. The opinions expressed in this review are true and honest. My husband commutes each day to downtown Atlanta. On a good day it will take him 40 minutes to get to his office. That is a lot of time spent in the car. 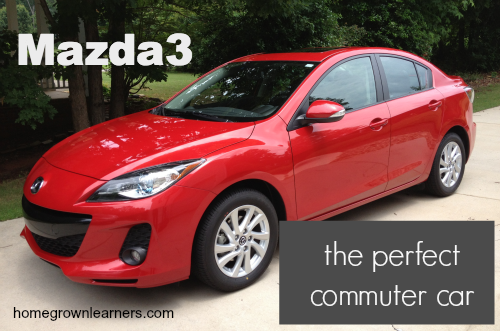 He happily drove the 2013 Mazda3 to work when I was given this car for the week to review. The Mazda3 is comfortable in hectic downtown traffic - navigating a congested freeway is made easy. The car "does all the thinking for you". There are side mirror alerts when another car is in your blind spot (Blind Spot Monitoring System). A rain sensor on your windshield means your wipers come on AUTOMATICALLY! The GPS system lets you know about accidents, congestion, and helps you map alternate routes. The average 35 mpg saves money. Headlights that function like eyeballs (they move as your car turns) are helpful when leaving early in the morning and driving on windy roads. Driving the Mazda3 was EASY and FUN. From music, phone connectivity, navigation, and all of the fun extras, this car was a PLEASURE to drive. All of the controls are easily within reach from the driver's seat. The TomTom navigation system is excellent. One of the features we loved was that it gave us the speed limit of the road we were traveling on, and also let us know if we were going over that limit. The car was fully enabled with BlueTooth phone and audio connectivity. Pairing my phone was so easy.... the first day of driving the car my phone rang and I simply pressed a button on the steering wheel to answer and safely take the call. Of course, a very nice feature was heated seats for the passenger and driver. The musician in me loved the Sirius radio and awesome Bose stereo. We studied music on the go each time we got in the car! My husband could easily play his favorite tech podcasts through his iPhone Bluetooth. My children loved the change the car symbol on the GPS system - totally not a necessity, but fun nonetheless. The Mazda3 was very spacious. There was more than enough room for a family of four. The trunk was quite roomy, and as you can see above, the back seats fold down to allow room for hauling longer items. SkyActive-Drive 6 speed automatic transmission - fuel efficiency and vehicle safety are paramount in this car. This feels and drives like a very safe car. It was given a 2013 top safety pick award by the Insurance Institute for Highway Safety. This vehicle is perfect for a commuter who has a family - because it easily seats 4 people. The fuel efficiency makes it easy on the wallet, and it's still sporty and fun to drive. *A word of caution - drivers over 6'2" may find there isn't enough headroom in this vehicle. This would have been our only complaint. Of course, a second opinion is always good. Perhaps the opinion of a 13 year old who is OBSESSED with cars (and really knows his stuff) might be more valuable. My friend, Ryan, happily went over the car for me and offered his thoughts. 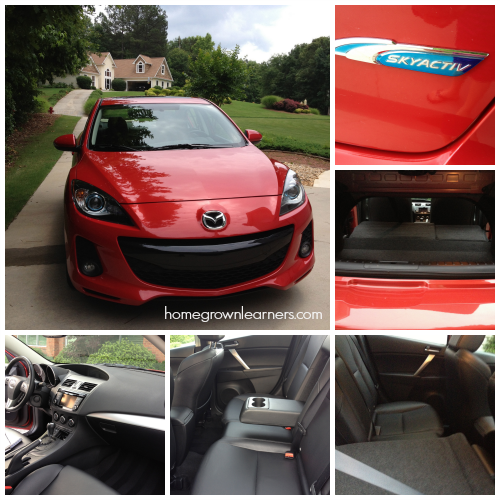 This Mazda 3 is a 5 seater car with a beautiful black leather interior. The Bluetooth is very easy to use, It's just as simple as pressing a button on the leather covered steering wheel: just connect your phone to the car and you can make phone calls, play your music and Siri is connected to the Bluetooth system. The trunk is medium sized - very easy to operate on your key fob. There is a button - press it and it pops just a little bit then press a tiny little button and lift up. I personally love the interior. It is stylish, but seems to still look sporty. This car is listed for $27,800, but is well worth the money for all the features and technology you get. I LOVE IT!!!! And you'll love it, too! If you are in the market for a commuter car, or just a fun car to zip around town in, the 2013 Mazda3 might just be for you. It is fuel efficient, technologically advanced, and quite intelligent! We thoroughly enjoyed our week with this vehicle!